I love fashion with a sense of humor. That’s why brands like Kate Spade New York, Markus Lupfer, and Anya Hindmarch speak to me. The dress fits like a dream but it has bananas on it! I mean, come on! It’s like this dress was made specifically for someone like me. 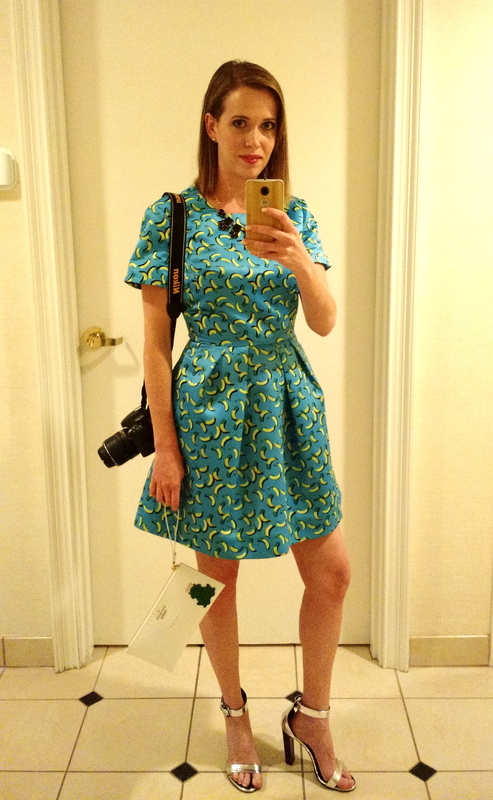 I wore it for a night out to the Fashion Week San Diego Spring Showcase at Harrah’s Resort. I felt great in this baby. There’s obviously a lot going on with the dress so I kept accessories simple (for me at least) and just wore a statement necklace. No bracelets or rings required (that purple thing on my wrist is my admission ticket). My Kate Spade New York wristlet was relatively simple as well in plain white leather but kept it more ‘me’ with the little frog prince patch. Thanks, Doll! It was just too cute to pass up! Your hair look fab + the outfit of course!